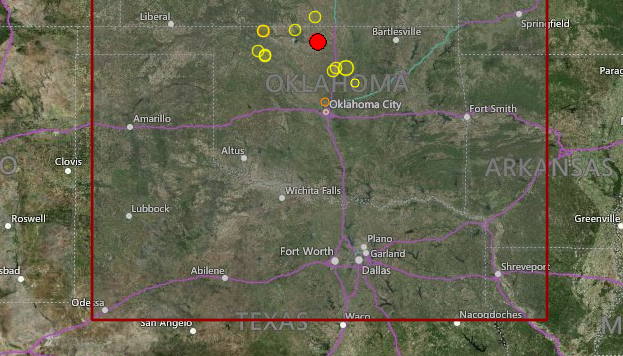 Earthquake Prediction: 3.6R in OKLAHOMA <----Spot on! 3.6R in OKLAHOMA <----Spot on! A 3.6R event in Oklahoma has been reported today. In a similar fashion to the previous post here, we have another wonderful prediction although the event is within normal Oklahoma magnitude, (nothing unusual). We predicted this event for yesterday, came in late, and we predicted for Oklahoma (35.3N, 95.2W, 97.1W. What we got today is...(36.69N, 97.67W) Not bad at all. Just a degree off in one direction.